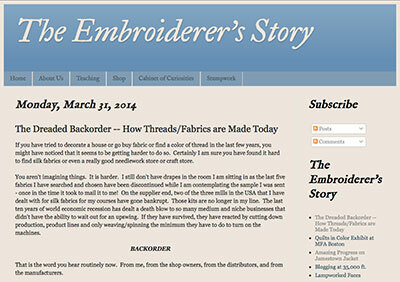 Today, I want to share with you three things that every avid embroiderer should read. Two are what I’d call “serious” subjects – they’re for embroiderers who think about wider issues related to needlework. The third…well, the third is your dessert. It’s your reward for reading the other two articles. So, if you clean your plate on the first two articles, you may go ahead and follow the third link. Whatever order you take, they’re all worth reading! The first article is titled “The Dreaded Backorder,” and it can be found on Thistle Threads. Why is it important to read this article? Because it unfolds for us – the embroidery “consumer” – the tenuous nature of the embroidery supply chain. In an age where we’ve become all-too-accustomed to the “I Want it Now” model of shopping, the article will go a long way to remind us of the old adage, Good Things Come to Those who Wait. When we order specialty threads and supplies, they may very well not arrive on the doorstep in three days’ time. Amazon and other major online shopping venues have accustomed us to instant gratification, but in the needlework world, instant gratification comes at a very high price, and it isn’t always achievable. Tricia’s article should awaken in us an appreciation for the risks that small businesses – from the manufacturers to the distributors to the retailers – take to bring fine needlework supplies to the market. The second article on my “Must Read” list for this week came to my attention via Mollie at Wild Olive. 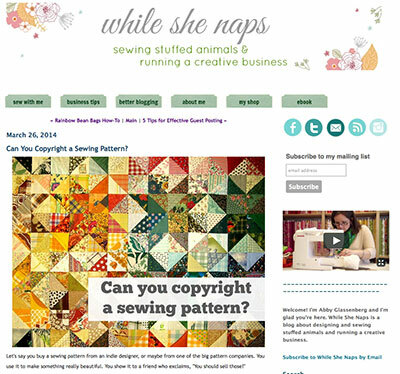 The article is titled “Can you Copyright a Sewing Pattern?”, featured on While She Naps. I’ve written about copyright and embroidery here in Needle ‘n Thread, and if you read “Can You Copyright a Sewing Pattern,” you will see how the concept of the sewing pattern parallels the same idea in embroidery, when discussing embroidery stitches and techniques. In the article, attorney Jen Bernstein, offers a good explanation (with supporting documentation) of a subject that can be somewhat hazy to the legally uninitiated. And now that you’ve had your dinner, it’s time for dessert! 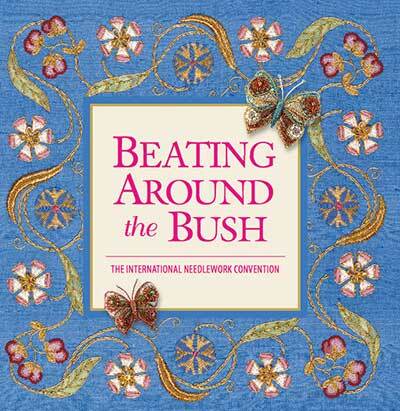 The catalog for Beating Around the Bush 2014 is available from Country Bumpkin! To get the free PDF download, you’ll be asked to input your contact information and you’ll be placed on the BATB mailing list. Once you do that, you’ll have access to the catalog. Whether you’re going to Beating Around the Bush at the end of September this year (it takes place in South Australia) or not, you’re going to want to see the catalog! Of course, seeing the catalog could just lead to a nasty case of Envy…but the catalog’s worth it. There are some Really Beautiful Projects on offer this year, and you’ll definitely be inspired by them! And that’s your reading activity for the day! If you did it all, you get three gold stars. Tomorrow, we’re going to look at a piece of embroidery by a reader. It’s her first piece of embroidery of this type, and wow – it came out nice! Questions, comments, suggestions on the topics above? Have your say below! Back Ordered does not concern me as much as No Longer Available or Discontinued. Yes, I see what you mean! But they all stem from the same situation…. Oh my oh my! That catalogue is so absolutely exquisite that if I weren’t on limited income I’d be booking passage to Austraila immediately! I’m drooling on my desk, honestly! Thanks Mary. Envy is alive and well. Ooh, bad words, Lynn! I know well what you mean, but . . . all you need is “moon money”! I also drooled and got much inspiration for doing some of those things MY way! I thought about how it will be spring over there with tea to drink and people who “talk funny.” . . . No second eye surgery as the passes were closed. we finally got our big winter snow. My linen and hoop and tambour needle came from Hedgehog — also the second bead embroidery book! I drooled on a large stash of special threads, pearl cottons, metallics, to try the tambour needle with. Thank you, Mary, for showing us your rich world! Thank you Mary for the very informative articles. I read Tricia’s article yesterday, and she has a follow up today. I’m definitely interested in the copyright issues and will read that article today. I see many ladies share patterns, and it makes me cringe as I know a lot of the ladies who make these patterns and are trying to make a living from their sales. I know it costs a bit more to buy them, but I think it’s worth it. Remember the big scandal with Napster? This is a very similar issue, albeit quite smaller in scope. As for BATB, it’s always a treat just to look at the lovely items. I went there in 2009, and it was just lovely! I’m so glad to see you put in a plea for the vanishing meedlework and craft stores. I’ve been meaning to comment for some time about your recommendation for obtaining the books you recommend. All our rare- and secondhand bookshops are vanishing because of the global retailers, who can give discounts because they don’t pay any tax. I’d like to put in a plea for people to buy online from those small booksellers. Many of them use abebooks website, unfortunately owned by A*****, but will still make a profit if you buy from them. I found a copy of susan o’connor’s monogram book from a small bookstore in the USA for just $8!! So I would say, even if it costs slightly more, although it may be cheaper, support our independent booksellers before it’s too late! I’ve used abebooks, with no problems, on a few occasions. It’s a great resource for out of print books. My other big sources for needlework books has been library book sales and the local EGA garage sale (members sell books and materials no longer wanted with proceeds to the guild). There are a couple of independent used book stores near me, sadly, they seem to focus on only fiction. OTOH, that’s probably a good thing for my shelves and bank account. I meant to add – abebooks is great when I’m looking for a specific title, library book sales and EGA garage sale – not so much. Thanks for the interesting links. I follow The Embroiderer’s story, and have been amazed at how Trish has been able to persuade artisans to try to reproduce some of the threads and materials that have been lost to “progress”. The copyright info was interesting as well; the laws are so confusing even to the professionals that it’s good to get various legal interpretations from time to time. Thanks for the links to two very thought-provoking articles. I’d been feeling frustrated by the limited range of linens available in accessible retail shops in Melbourne, and while I knew it reflected the size of the market I hadn’t realised how far back along the supply chain the problems went. The articles are very interesting, now I understand why it’s so, so difficult to purchase good quality fabric or threads in the UK. It’s impossible to purchase such fabric as Alba Maxima or Alabastor Angel etc, the same applies to needles you can an enormous amount of John James but I have terrible trouble purchasing Bohin needles which I prefer to use, but we should support independent embroidery outlets. As for the copyright it’s quite confusing to understand the legal copyright laws. I wasn’t able to look at Beating Around the Bush as I have trouble with PDF files at the moment. But thank for highlighting these important issues. It’s not just the specialty needlework supplies, some major industrial trades are seeing problems with years of experience going out the door on retirement. Yes, learning the basics of operating a machine can be done rather quickly, but learning the feel and temperament of the various machines and materials takes time. Beating Around the Bush – the catalog itself is a wonderful source of inspiration! Let’s see – airfare + lodging + classes + supplies = not in the budget, sadly 🙁 Not only that, I’m guessing that maybe a lot of these are not beginner’s classes? Some of these techniques I’ve never heard of, let alone even tried. This was incredibly interesting. I wonder if any groups of stitches could/would do a run and share the bulk order. It might be a way for us to support the industry and share the burden of costs. Wish I could go to the Australian conference. I will probably treat myself to one of the conference kits that are sometimes available on Australian Needlearts after the conference. Why is embroidery so much more complex and popular south of the equator? Has anyone else noticed this? Hi, Anastasia – if you check Thistle Threads today, here: http://thistle-threads.blogspot.com/2014/04/a-kickstarter-for-historic-threads.html you’ll find an article about a new “club” – it’s the same concept. People interested in these unique threads can sign up for a quarterly shipment of various threads made in very limited runs. Sounds like a good idea! There’s a short survey to fill out, to help clarify interests. My interest rests more in the contemporary application of the threads, rather than historical reproductions. I definitely hope to be a part of it, when it comes about! Thanks Mary. I bookmarked the page and will fill out the survey. Depending on what was being ordered, I might order just to increase my stash and inspiration. I do love old things and reproducing them, but I also love to mix techniques and try new takes on old materials and methods. Either way things will be put to good use. Wonderfully informative articles. Thanks for sharing and the dessert was absolutely delicious. I always wondered about adaptation of design, because I seem to springboard off someone’s idea, but I would always want to give credit for the original. I like the idea of a club for unusual threads.Definitely will look into that survey. Oh Mary – too right about being envious! And to think that I lived in the Glenelg area of South Australia many years and at that time didn’t embroider and knew nothing about all the wonderful opportunities for learning there. I could have walked straight down the beach to the Beat Around the Bush classes. Arggh, I could just do a very unladylike spit! Next Next post: Reader’s Embroidery: First Ecclesiastical Piece!